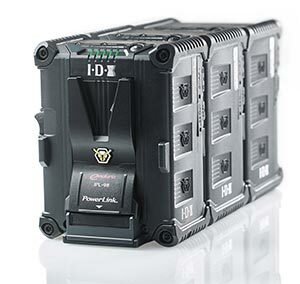 Sometimes batteries can be interesting and this year with IDX is one of those years with not only improvements in the V-Lock range there are significant changes within the 7.2volt area. For years now, the HL-9 has been the battery of choice for serious users that need linking batteries. To make changes to it without compromising the initial concepts has been difficult, but that is precisely what they have done. So lets take a look at what has been added and see how this affects you, the user. In Power Link mode, the power is taken from the rear most battery. When this battery is discharged, it can be replaced with another fully charged one. Therefore there is no need to power down rigs to swap the battery. You can also use a mixture of both IPL models, so the IPL-95 and IPL-150 can be linked. Many users have purchased other models of IDX V-lock batteries. The good news is that these link onto an IPL battery as the final battery in use on the equipment. When you come to charging the IPLs there is a major benefit. The VL-2000S charger introduced last year can take a free software upgrade to enable it to stack charge the IPL batteries. Effectively the two channel charger becomes an eight channel charger. Also to make things simpler for the camera ops people, the battery on top of the stack is the first charged. Life just got easier! And to help them in the dark areas of the set, there is the V-Torch feature. A small LED light on the battery. When activated it illuminates for around ten seconds. Just time to find the right BNC input. The New IDX Advanced D-Tap which is not just a D-Tap output but also allows you to charge via the optional extremely light weight VL-DT1 charger. This combination is great again for someone who has to travel light! Finally a powerful 2.3Amp USB DC output to power the growing number of ancillaries that use this plug. If you want to go light and on planes (similar to existing HL-9 users) then the IPL-98 would be the obvious choice for small crews. Weighing in at approximately 730grams and 95Wh compare to the HL-9 at 739grams and 87Wh.